Unlike the free version, this Expert Advisor uses a news filter and additional filters to determine the trend. It protects orders with the help of locking. The robot uses martingale. This EA use pending orders. 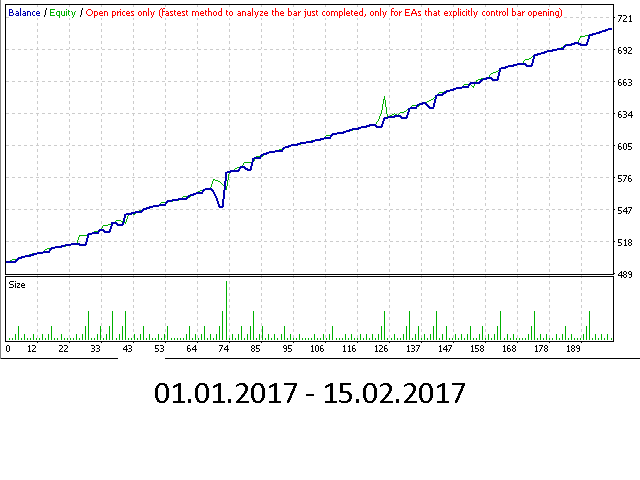 Sooner or later martingale can lose the deposit, it is recommended to control the trading of the EA while analyzing the market. The EA trades on any symbol. The minimum recommended deposit is $1000 (it is better to start with a cent account). The EA works on M1 timeframe. Attention! To work with the adviser, in the terminal you need to open "Tools"> "Settings"> "Advisors". Check the box for "Allow WebRequest for the following URLs:". Add the following: "http://ec.forexprostools.com/?columns=exc_currency,exc_importance&importance=1,2,3&calType=week&timeZone=15&lang=1" and click "OK." From there, the news calendar will be loaded. Самый лучший советник из всех которые я перепробовал!!! Роман респект!!! Excellent EA. Running on two real accounts (STP and ECN) for two months (v1.2). So far so good. Outstanding technical assistance from the developer. Thanks a lot, Roman! Мониторинг реального счета (центовый) - https://www.myfxbook.com/members/vaulin/marse/2115859. В статье есть и другие мониторинги этого советника (1.демо и 2.с уменьшенным депозитом). The best robot i ever use on real account. Я решил написать отзыв об этом советнике потому что он неплохо зарекомендовал себя на бэктесте и на реальном центовом счете за прошедший месяц, советник использует маргингейл поэтому отзывы типа "при депозите 5000 я увеличил лот 0,01-0,1 и советник потерял деньги" это отзыв человека который не понимает суть работы данного эксперта повысил риск в 10 раз при том же депозите, на что Вы надеялись? Он высокорисковый но при правильном подходе к контролю за рисками способен приносить прибыль как и все советники с использованием мартингейла. Стоимость советника на мой взгляд не высока, автор обещал доработать контроль за трендом поэтому пока ставлю только 4 звезды. P.S. Вам продают лишь инструмент а как Вы им воспользуетесь это уже Ваша работа. Спасибо Роман! Running on vps with low spread broker. After 9 days of live trading up 227.82 on a 1 k account balance. Only running on eur/usd. No major DD as yet. EA is running on vsp. Starts form release 20.02.0217... I will update results form live my accounts. Prevously I was using free version and results were good. 1. Для каждого из фильтров добавилась возможность указывать до 3 таймфреймов, на которых будет производиться анализ. 1. Добавлена возможность в индикаторе MARSI отключать MA (увеличивает скорость тестирования, результаты могут отличаться). 8. Перебрана и изменена структура настроек. Hedging with elements of locking. Added GRV filter. 1. Added compliance with FIFO rules for virtual take profit. 2. Added Spred parameter that allows you to stop trading when the spread exceeds the value of this parameter (in points). 3. In case of a virtual take profit, in the event of an unsuccessful closure, the order repeats attempts to close until all orders are closed. Fixed a problem with instruments that have 4 decimal places. Added the news filter (stop loss can be set when trading with the news filter). Developed and added a completely new system for determining the strength and direction of the trend. Also, the additional filter has been replaced by a filter based on the ADX indicator. Added new filter based on the MACD indicator. Added: comment to orders, management of trading on Monday and Friday, the maximum number of orders in a series. Fixed bug with virtual take profit. CloceAllOrdersInFriday - if set to true and FridayTradeOff = true, the EA will close all orders on Friday at the specified time; if set to false and FridayTradeOff = true, the EA will continue maintaining the opened orders, but will not open new series of orders.